On the third of October, Cursed Uppsala occupies “Psykosen” for the first time with Uppsala’s own Usurpress, Bombs of Hades and Yuri Gagarin! First out on stage are Bombs of Hades who’ll treat us with crusty Västerås-death metal. Their third full length album “Atomic Temples” was released by War Anthem Records earlier this year. Deathpunk-favourite in reprise. Usurpress continue to crush with d-beat and old-school death metal with the new album “Ordained” whose release is planned in conjunction with this concert. Enjoy a sneak preview below. Yuri Gagarin from Gothenburg ends the night with heavy psychedelic stoner in true space rock spirit. These guys rarely play in these parts so don’t miss this! Entry: 100SEK (including membership for the rest of 2014), 80SEK for members. The venue is a 20 minute walk from central Uppsala and there are good bus connections with busses 2 & 5. Let us know beforehand if your coming since this venue is noticeably smaller than our last one and could very well become full. Send a mail to lena.vincent@curseduppsala.com or send a private message via our Facebook page to register, get more information and directions to the venue. In that message we need your full name, social security number and an active email address. If you’re not a member we’ll make you a membership card that you’ll receive at the door. If you’re already a member, just send us your name and membership number, we still want you to let us know beforehand if you’re coming since the venue is likely to get full. Again, send this information to lena.vincent@curseduppsala.com or in a message to the official Cursed Uppsala Facebookpage. This event is organized in cooperation with ABF. During “Easter Monday” (Annandag påsk) we’re visited by the British funeral Doom band Esoteric. This exclusive Swedish appearance is the first they’ve had in Sweden during their 22 year long career. A doomy night without comparison approaches together with Procession, Isole and Serpent Omega. Esoteric is Funeral Doom in it’s darkest. Uninitiated may listen to their latest creation via the links below. Originally Chilean, yet nowadays based in Uppsala, with members from such bands as In Solitude. Procession enchant with their old school Doom Metal. Fans of Candlemass should not miss this. Isole, with members from Ereb Altor who recently visited us, are the second band on stage with their Epic Doom. Serpent Omega, who recently released their heavy debut album, act as local support. Entry: 200SEK at the door, 160SEK for members and pre-purchased tickets. Buy tickets via our webshop and 4Sound Uppsala. http://curseduppsala.bigcartel.com/ expect a service fee of ca 10SEK when purchasing through the webshop. Membership, to get cheaper entry/presale price at the door through the whole of 2014, will be available for purchase for 100kr. We are now having a sale on our current t-shirt stock. 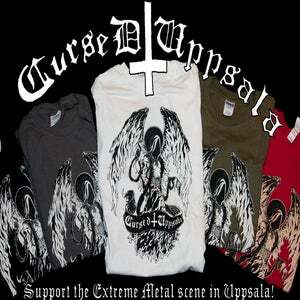 Visit our webshop to support Cursed Uppsala and help us make more exclusive club gigs! We must sadly announce that Eldkraft has to cancel their scheduled performance due to illness. We are truly sorry about this and we’ve sadly not been able to find a suitable replacement due to holiday time constraints. Instead Ereb Altor will provide a longer set than usual! Vi måste dessvärre meddela att Eldkraft tvingas ställa in på grund av sjukdom, vi är fruktansvärt ledsna över detta. Vi har letat efter ett passande ersättningsband men har inte lyckats med såpass kort notis i jultider, och vi hoppas att ni har förståelse för detta. Istället kommer Ereb Altor att bjuda på ett längre set än tidigare planerat! Thyrfing early ticket sales concludes soon. Tickets will be available at the door. Since it’s less than a week left we’d like to inform you about the last days that presale of tickets are available. Tickets will are also available at the door of the show. With the aid of slump.nu we have a winner and it is number 2! Congratulations to Matilda Åslin who can pick up her prize at the entrance. The secret consolation prize goes to number 100 and it’s owner Tiina Wennström! What she gets she’ll find out on the 14th of December.